Our Bluetooth Key Finder lets you track your items in style. Easily attach it to house keys, car keys, bags or pets. Connect it to our free iPhone or Android app so you can see its location wherever you go. Yes. Our Bluetooth Key Finder ships with a replaceable CR 2032 battery so no need to purchase a new key finder when the battery dies. How many items can the app track? 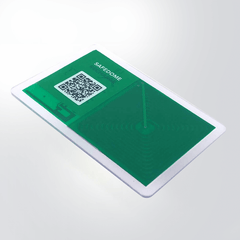 The new version of the Safedome app will be released November 2018. This version of the app actively tracks up to 5 items at one time. How loud is the Key Finder? 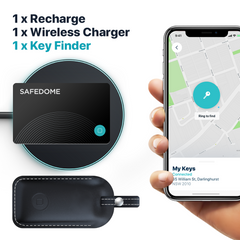 You can ring the Key Finder using the Safedome app. The internal buzzer rings at 85db depending on proximity. Multi-packs will be available to purchase online from late 2018. The Key Finder uses Bluetooth 5, the latest version of the technology. The range is about 100m outdoors and 30m indoors depending on the strcuture of the building. Can I change the casing on the Key Finder? In the future we are looking at ways to customise the casing for your Key Finder.